Floods are the most common naturally occurring disaster in the United States, and occur in all states. Since flooding is common in all parts of the United States, it important to be prepared no matter where you live. If you live in low-lying areas or downstream from a dam or other large body of water you are at even greater risk and should take appropriate precautions. Flooding is triggered by many natural and man-made events. They include: tropical storms, hurricanes, heavy rain, rain following a wildfire, melting snow run-off, and levee and damn breaches. Flood Watch: Flooding is likely. Tune in to your radio or local television station for information. Flash Flood Watch: Flash flooding is likely. Be prepared to move to higher ground; Tune in to your radio or local television station for information. Relocate the furnace, water heater and electric panel in your home to higher level, if you live in an area that is at risk for a flood or has experienced flooding in the past. Consider installing "check valves" to stop flood water from backing up into the drains of your home. If possible, construct barriers to stop floodwater from entering the building and waterproof walls in basements with waterproofing materials. Having the proper emergency preparedness kit, having a plan, and knowing what to do before a flood strikes, will greatly improve you and your family’s chances of being safe. Complete the 3-Step Emergency Preparedness Planning Guide today! Getting an Emergency Preparedness Kit for your home, office (or school), and car(s) is an essential first step in being prepared for a flood. Emergency Preparedness Kits from Essential Packs, provide you and your family with the emergency supplies your family needs to last for 3 days (72 hours). Deluxe Kits from Essential Packs are compliant with FEMA's guidelines and include important items like: emergency food and drinking water, flashlights, radios, first-aid supplies, sanitation supplies, emergency blankets, waterproof ponchos, and much more. For additional help on selecting the right kit, visit Step 1 - Get A Kit of our Emergency Preparedness Planning Guide. 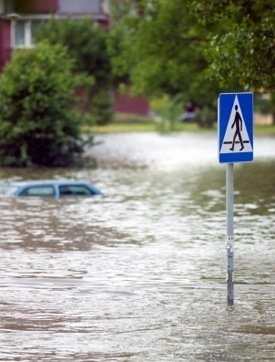 In order to know what to do when a flood occurs, you need to create a Family Emergency Plan. Sit down with your family members and decide how you will get in contact with each other, where you will go, and what you will do in the event of a disaster or emergency. To make this easy, Essential Packs provides you with a Family Emergency Planning Document that you can download for FREE. Simply open this PDF document and fill-in the blanks, then, print a copy for each family member, and store one copy in your Emergency Preparedness Kit. You should update your Family Emergency Plan every six months, as phone number, work locations, and other important information could change. For more help on creating a Family Emergnecy Plan, visit Step 2 - Make A Plan of our Emergency Preparedness Planning Guide. The final step to getting prepared is to be informed about what to do before, during, and after a flood. FEMA's In-Depth Citizen's Guide to Disaster Preparedness helps you do this by providing you with comprehensive emergency preparedness information a variety of disasters. Visit Step 3 - Be Informed of our Emergency Preparedness Planning Guide to download FEMA's comprehensive, 200 page book called, "Are You Ready? An In-Depth Guide to Citizen Preparedness".